Nikolsky, Ronit, István Czachesz, Frederick S. Tappenden, and Tamás Biró, eds. 2019. Language, Cognition, and Biblical Exegesis: Interpreting Minds. Scientific Studies of Religion. London: Bloomsbury. The study of ancient religions and biblical studies are dominated by textual evidence. However, the cognitive science of religion lacks significant research on the language and textual interpretation of this literature. 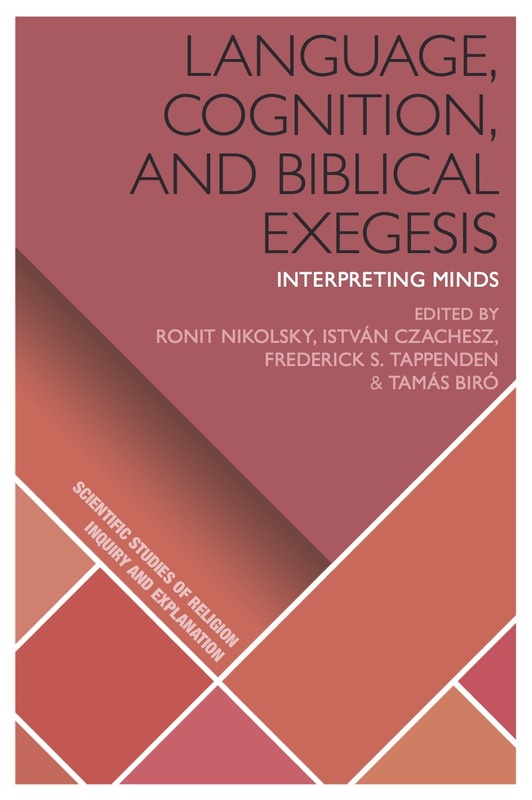 This book presents a systematic attempt to redefine the interpretation of religious texts in a cognitive framework, providing concrete textual analysis of a broad selection of biblical passages. It explores the ways that cognitive approaches to language and textual interpretation expand the disciplines of the cognitive science of religion and biblical studies. This book brings together methodology from the cognitive sciences, linguistics, philology, biblical studies, and religious studies to offer a new perspective for biblical studies and cognitive sciences. It presents a renewed vision of textual interpretation—one that aligns hermeneutical reflection with our cognitive capacities. A splendid collection of essays from an outstanding group of scholars that insightfully illuminates biblical texts—both Hebrew and Christian—and the cultural settings from which they arose. A treasure trove of studies and applications of cutting-edge science from leading biblical and cognitive science of religion scholars. This is a must-read for all interested in new approaches to ancient texts. This book provides us with a whole new meaning of the word exegesis. Without replacing conventional outlooks, each author sees the text through the cognitive looking glass, helping us to see, like Alice, that what we thought we knew might need to be revised.